Food is the #1 Holiday Gift! In an exclusive Counselor Magazine survey of Holiday Gift Buyers, food gifts were ranked as the most popular category, nearly 3 times more popular than the second place category. Over 75% of the Fortune 100 companies choose Maple Ridge Farms gift program. If you care enough to give the best to your loyal customers and employees why not try our superb food gifts this year? Gift Certificates are also available. For custom imprinted 5 Day Express orders follow this link! Click on the text for more information. 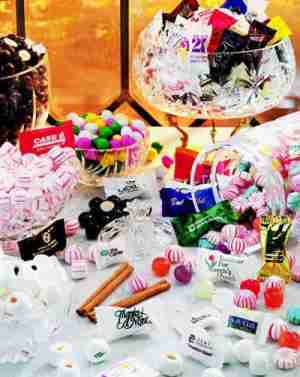 Branded wooden boxes with Mixed Nuts, English Toffee, Chocolate Almonds or other assorted candies. Hams, Cheeses and other food Gift Basket Ideas available with your logo custom printed on the bow. 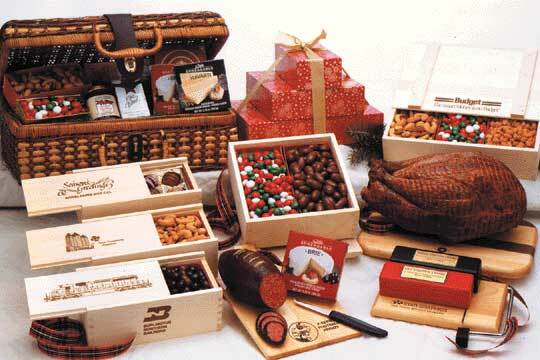 Food gift assortment, gourmet specialty basket filled with meats, cheeses, and more. 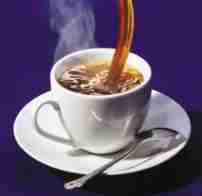 Gourmet Coffee, Tea, Coco, and Cappuccino Gifts. Even mug stuffers for your imprinted coffee mug! Hospitality Mints are individually packaged fresh in their own custom printed package proudly displaying your custom logo or identity. 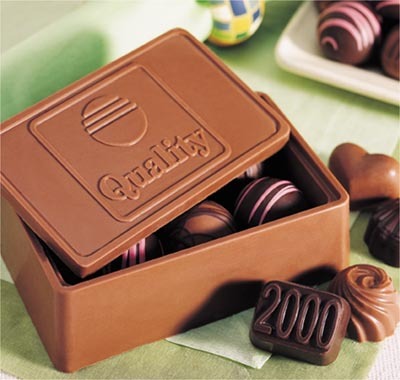 The memory of a delicious piece of Chocolate lasts, as long perhaps as the memory of a superb meal. Long after tradeshows are over, long after trinkets and advertising gimmicks are discarded, people remember chocolate.